IN MY other role as an editor rather than a writer of books, I take raw manuscripts from Iclients and friends and transform them into something publishable and popularly readable. I’ll write more about editing as a profession one of these days, because it’s an art unto itself that bears all the challenges but very little of the glamor and rewards of authorship. In the meanwhile, I’d like to talk about one of my most recent editing projects, a book about travels around the world by someone who has to be the most happily peripatetic (that’s a fancy word for “footloose”) person I know. Julie Hill was a client before she became a friend. We were introduced to each other more than ten years ago by Jimmy Laya, who knew Julie and her late husband Arthur back from when the Hills lived in the Philippines, where Arthur represented the Ford Foundation. 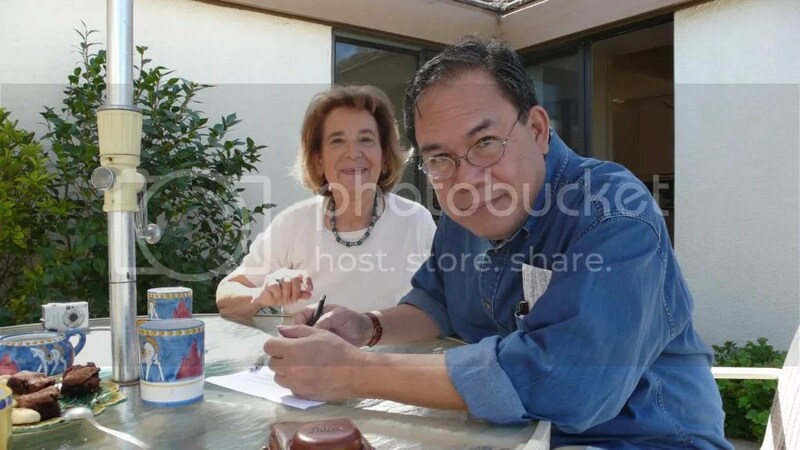 Then based in Southern California, Julie wanted to write a book about her life and travels with Arthur, who had just died of cancer; together, the couple had journeyed around the world, from Australia to Afghanistan, from Bangkok to Minnesota, from Samoa to China. Julie—born an Alexandrian Greek, trained in chemistry, and later a telecommunications executive—had all these stories to tell, and she needed an editor to help her tell them. Jimmy put us together, and Julie’s first book, Promises to Keep: The Travels of Arthur and Julie Hill, came out in 2003, published by XLibris. This was followed a few years later by her second book, The Silk Road Revisited: Markets, Merchants, and Minarets (Author House, 2006). Not one to spend her widowhood moping, Julie has been actively engaged in all manner of civic pursuits, especially in her patronage of the Scripps Research Institute. 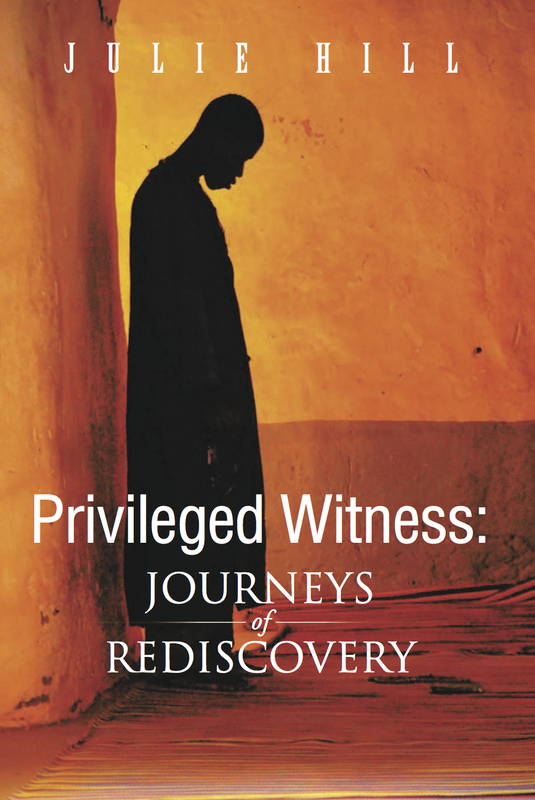 Just last month, she published her third book, again with me as editor, Privileged Witness: Journeys of Rediscovery (Author House, 2014). In her new book, Julie takes us in hand on her journeys to around 20 countries, from Asia to Africa, to places such as Papua New Guinea, Mali, Bhutan, Botswana, and Ethiopia. She doesn’t take just the well-trodden tourist paths, but goes to the heart of the native culture, engaging with the locals to do what all good travelers (more than tourists) do: discover and reaffirm the universality of humanity. Not everyone has the ability and the resources to do the kind of traveling that Julie does, so I suggested the book title to her (taken from one of her essays), to take “privilege” in both senses of the word: as the ability to afford things, but also as the unique opportunity to see things few others could. And with that privilege comes the responsibility of witnessing and reporting. “The art of adventure is the art of being bold enough to enjoy it. On a safari I must have spent hours tracking the footprints of wild animals; for other travelers the hours were too long and boring; after having seen one giraffe the others seemed all the same to them. But for me the tracking process was a fascinating adventure and locating that pride of 13 lions was an unparalleled reward, a golden joy. I could hear the muezzin in the Middle East (so much more inspiring when it is not a recording) calling the faithful to evening devotion. To me, the muezzin’s call—whether in a remote Central Asia bazaar or resounding among the tufa walls and spires of Timbuktu—is like a congregation of mountains praying. In a message to her after the book was published, I told Julie that I had just watched a TV documentary about Aleppo in Syria—the subject of one of her best essays—and about the destruction that Syria’s current civil war had wrought on the ancient wonders of the place. I was almost in tears, I said, to see the Krak des Chevaliers being bombarded; without even having been there, I felt more invested in the world and in humanity, thanks to her book, for which I—in turn, as editor—was the privileged witness. This entry was posted in Art & Culture, Friends, Travel, Writing and tagged books, Julie Hill, nonfiction, travel by penmanila. Bookmark the permalink. Hey Butch, I really like this piece. If you and Beng are now in Centreville, please join us at an International Festival — food, music and dances — at the grounds of St. Timothy Catholic Church on Poplar Tree. You call us at (703) 307-7123. See you soon, my friend.